This year was a pretty relaxed year, it seems. 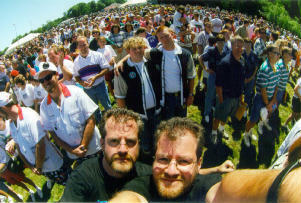 The weather was great, the people were all pretty psyched up to be there, and John and I met more and more people who had first heard of the festival, either from my web page, John's web page, or the official web page at www.twinsdays.org. These are quarter-sized representations of much larger pictures. To see something up-close (around 800x600 or so), just click on the smaller photo and a larger one will load. I recommend this for the full effect! Starting off with the obligatory shot of the boys getting ready to head off to their adventures. 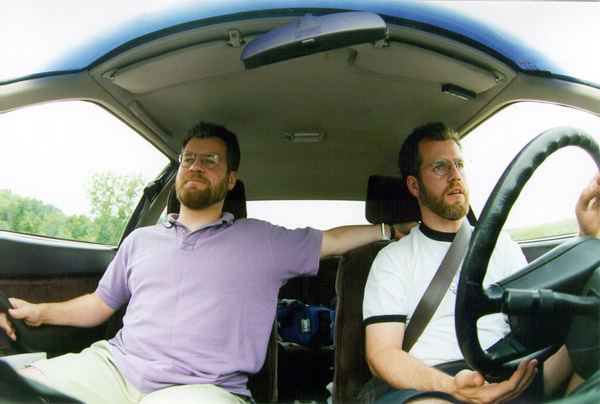 You gotta know that, before arriving in Twinsburg, John and I would pretty much rather not be dressed up identically. This is typical of our behaviour all through our lives (at least, since turning 12). The only concession to "identicality" is the matching haircuts, purchased simultaneously a week before departure. 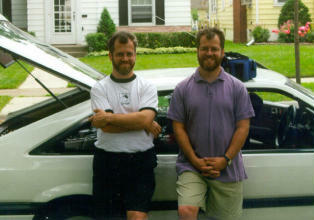 Here we are in front of John's car (which is in front of my house), ready to roll! I'm the one in the purple shirt. We arrived at Twinsburg on Thursday evening. This gave us all day on Friday to basically relax and fool around. Spotting this as an ideal time to catch up on our game of Frisbee, (we play but once a year!) we gradually gravitated towards the swimming pool. A beautiful 80+ degree day and there was almost nobody there! The 'bee was a fun toy to toss back and forth in the pool, though, and we had a ball flipping it back and forth with Nick and Jim Falco, seen here astride the able shoulders of Corrine and Carrie! Fast-forward to Friday evening, now. Everyone has gathered at the Dodge Middle School for the "Welcome Wiener Roast" (hey, free food for Twins! ), and after eating (or while eating) everyone gathers out back and meets 'n' greets! This gang of six are Chris and John (standing in the middle), Gary and Larry from North Carolina (kneeling), flanked by the two young Women on the outsides - Julie and Jessica from Georgia. 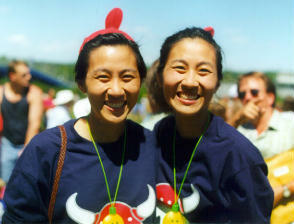 We met these two women LAST year (1997) in a McDonalds, while John and I were on the way OUT of Twinsburg. Apparently, they had a good enough time to come back. 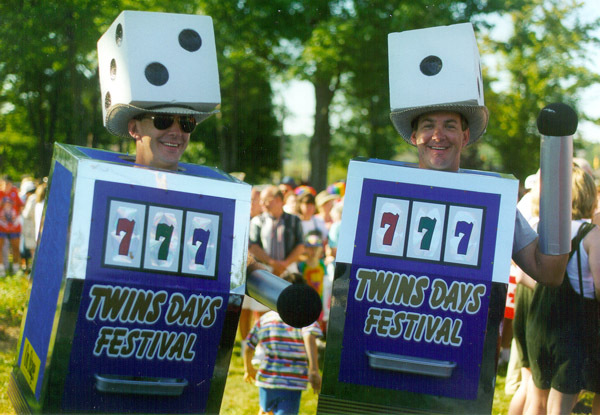 These guys probably won the contest for "most uncomfortable" costumes. Hailing from Las Vegas, Nevada, this is Vic and Rick. Even at 8:30 in the morning, they had already had their arms yanked up and down about half a million times by everyone hoping to score a jackpot. Heck, John and I did that probably 3 or 4 times in the course of chatting with them and taking their pictures. Fun guys, though. I didn't see them later in the afternoon, with all the heat and all... wonder how they held up? Ah! 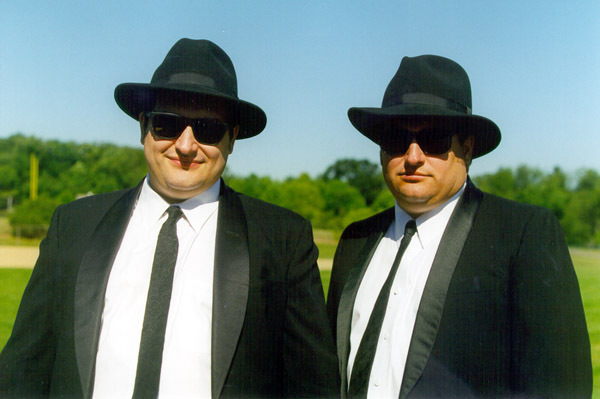 Jake and Elwood! (Well, actually, this is Dave and Don, from right here in Twinsburg, Ohio!). I actually expressed a disappointment to them that they weren't from Joliet, IL or something. They were polite enough to me, but they probably thought I was a jerk for acting DISAPPOINTED that they were from Twinsburg. Sorry, guys. Where was my head? I loved the suits, really. Slick! 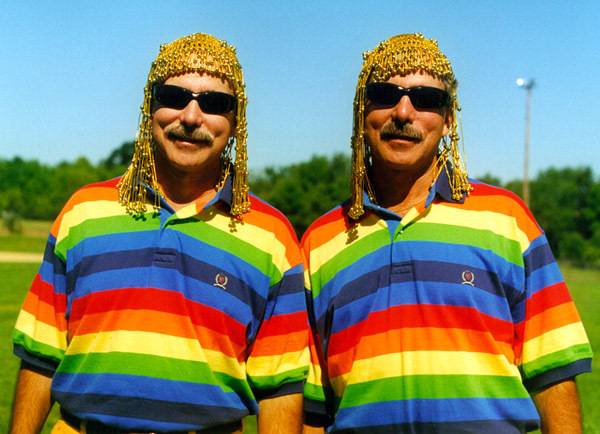 The rainbow-shirt guys are John and Joe, from Pittsburg, Pennsylvania! 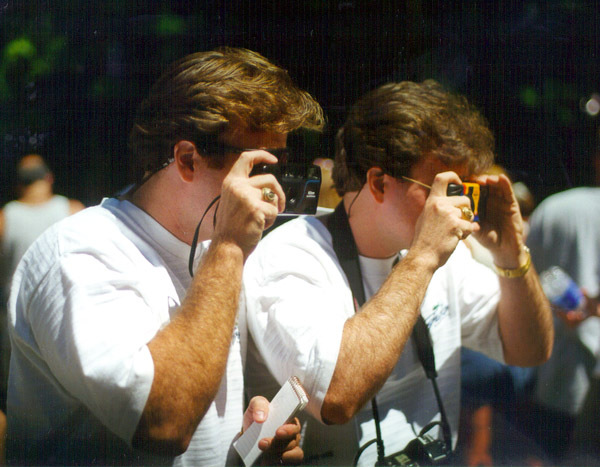 These are the Ferris Brothers - Richard and Robert! 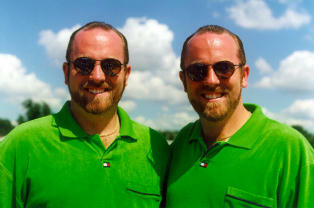 They maintain a rather large Twin-related website which is worth a look. 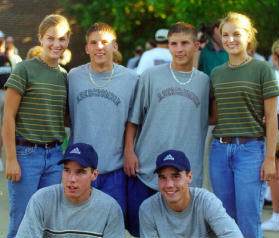 Tons of pictures from Twinsdays, and a lot of links to other twins on the net. 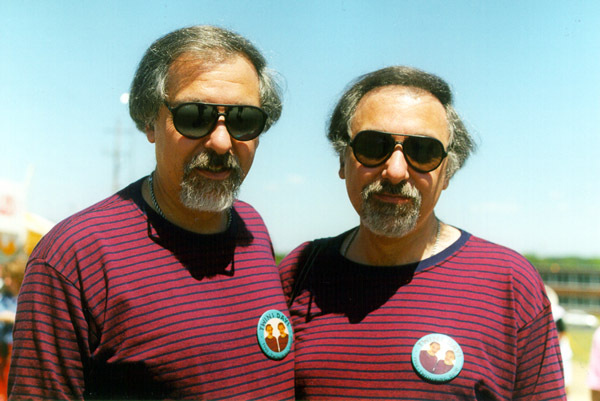 This is (on the outside) Ray and Ralph Stover. Ray has a nice twin page which covers a fair number of twin social events in the New Jersey area. 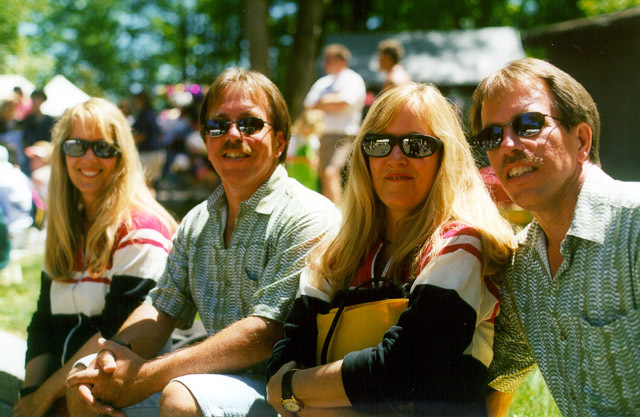 In between the two of them are Cindy and Lindy from Cypress, California. The totally surrealistic "synchronized photos" - you see a lot of the camera lenses when you go here... I didn't get these guys names, but they're using Ray and Ralph's cameras to take pretty much the same photo which I just showed you up there - the foursome sitting on a low wall. 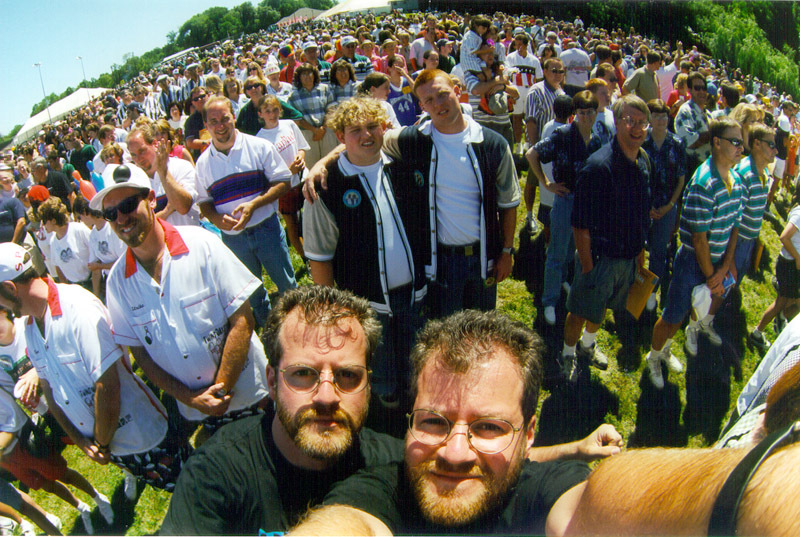 Every year, John and I go walking around chit-chatting with people. "Is this your first year?" "How many years have you been coming?" - the basic questions. When we asked these young ladies (Melissa and Elizabeth from Pennsylvania) how many years they'd been coming, the answer was great: "Every year!". They've been coming for 17 years! This, I thought, is totally cool! Okay. Time for a bit of humor. The [???] 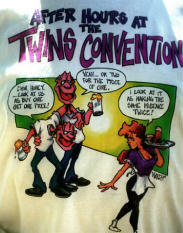 twins, Don and Ed, were sporting some pretty cool hand-made T-Shirts. Seems one of 'em has a son who is a pretty good artist, so he made these up. The fronts are pretty straighforward - an accurate representation of some of the evening goings-on.... You'd probably better click on the photo to get an image large enough to read! 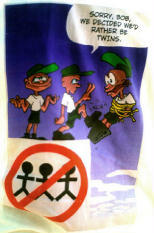 The flip side, however, just kills me. This is one of those cartoons which makes you recoil and say "that's horrible!" and then you giggle a little bit, try to act offended and shocked, and then you laugh some more. Sure it's "dark" humor, but... well, I just couldn't help myself. I thought this was hilarious. 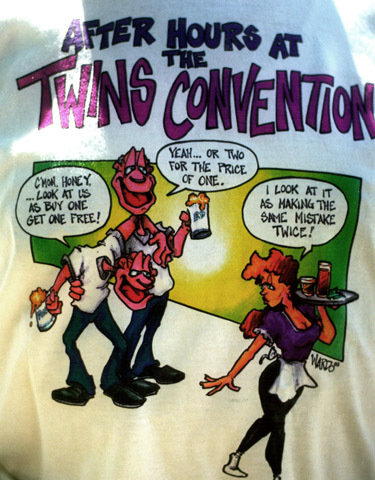 Wonder if these guys won anything in the contest for "most original" TShirts? They should have. 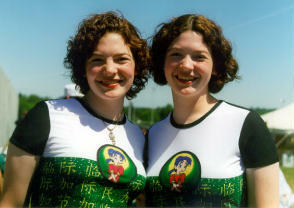 Hey, for the record, ALL multiples are welcome at Twinsburg - you don't have to be just twins! More proof that Steve and Jeff Nagel are not us - that's them on the left-hand side of the photo, with the bowling pins on the brims of their caps! Same story with this picture... 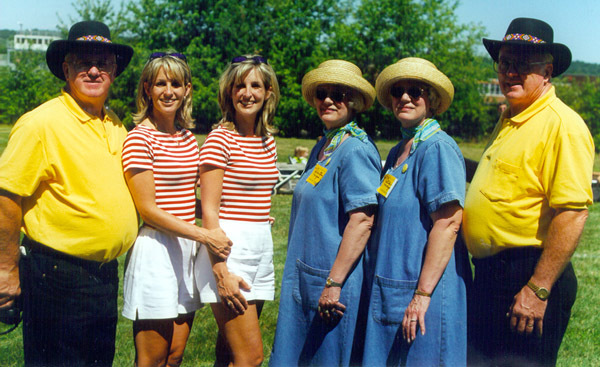 The tall blonde girls on the right wearing white t-shirts are Kristen and Kerry Baker, currently attending the U of Georgia. If you know the names of any of the rest of these people, please drop me an email so I won't have to look like a dodo forever! So that's it for now... I have another roll of film still stuck in the camera, and I'm going to get it finished and processed "real soon now". If any of those photos are memorable, they'll be here shortly. Heck, it only took me a month to put THESE up, so how much longer could it be??? ?